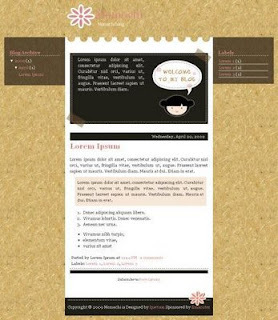 Introducing my new blogger template design, Momochi Blogger template. Girly and simply design suitable for your girl personal blog. No complicated setting. There's welcome message section with girl cartoon detail. You can put your daily quote or anything. Edit text widget through page element. tapi sing kuwi yo apik, tapi seperti biasa, sleret-sleret selalu menghiasi setiap templatemu..
to me this is ur greatest masterpiece babe.. I love it. I want it. But somehow I don't manage to download it successfully. :( What should I do? I am impressed with the theme you developed this blog. Really cool thing that you are inspiring elementary school students towards blogging including their interesting cartoon things. could u teach me hw to create a blog template? teach me by mailing me. Mas/Mbak... gw kan pake template "Baby Blue", nah di atas header itu kan ada menu navigasi "Home, Contact Me, About" klo gw mo bikin Contact Me & About ada isinya bisa ga' ya? jadi klo di klik lngsng menuju ke halaman yg dituju gitu... pliss petunjuknya.. I think this template is amazingly beautiful. It only lacks a favicon. Other than that, it's just the cutest. I am kind of in love. :) Great, great Job! Do you do customized templates? I'm a children photographer, looking for one column template. i love this and have it for my layouts... this is my favorite one i have ever used! I just used the template. I made a few edits, but it worked great for my blog. hi cebongipeit, I use this template in my hindi blog thanx a lot for designing a superb template. can u tell me how can I enter my blog name in footer....where ur website link is provided. please mail me ur answer at @ kashifhotcolddrink@yahoo.co.in. Baguz banggedd! Tapi, di komputerku, kok gak bisa didownload, ya? Mohon bantuannya! mau pake yang ini...tp kok follorwernya ilang? Gmn caranya biar ga ilang? gi mana mau masukkan ini template ke blogku? wonder.. instead of pink can we change the link to another colour? how? pls help. thanks!! YOU ARE ALLOWED TO DISTRIBUTE BUT NOT ALLOWED TO ADD ANY LINK ON FOOTER) in the term of use or can i take it? i would not take the footer. this is free right? I'd appreciate some help. Thanks! could you please tell me how to make momochi footer split into 3 columns? thans! i just loooove this template of yours, thank you so much 4 sharing! may I at least modify the header? ini link nya mana sih ? ada yg tw gk ?? I have spent tory burch most of my life in Kenya, East Africa tory burch shoes I was intrigued to hear MBT shoes, otherwise known tory burch outlet as Masai Barefoot Technology. MBT shoes cheap tory burch are most definitely not a fashion statement tory burch boots and can look a bit odd. Invented in 1997 tory burch flip flops by Swiss Engineer Karl Mueller, Mbt's tory burch handbag are seen as a highly performing aid to fitness. MBT's tory burch handbags outlet are designed to be breathable, tory burch heels and comfortable. The tory burch flats shoes uniquely mbt designed sole, very similar to the 'tory burch flats cheap ' often worn by East African Tribal people, are said to mimic tory burch wallet walking around barefoot in the sand. header-nya bisa diganti pake gambar gak, mbak? Momochi girls so very nice and interesting so that can be enjoy it in this blogger. Mostly are very enjoying it and lovely blogger shared on the site. So nice and interesting blogger shared on the sit so that can be enjoy it in this blogger. Mostly people are like it and enjoy it in this blogger.